We made 2 big improvements to the My Tasks and People views in the app. 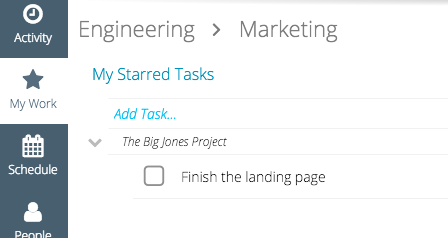 1) You can now sort all of your tasks that are in your My Tasks or People views. Previously you were only able to sort tasks if they had a parent task in the list but now your parent tasks are sortable too. Your Starred and Assigned lists are also listed in the same order as they are in the project, this means if you sort in your Starred or Assigned lists, your changes are reflected in the main project. As promised, we will continue to lower prices or give you more for your money. Starting this month your archived projects no longer count toward your total project count. Many companies create a new project for each customer and when the project is complete they archive it. This helps keep the app uncluttered but still gives you the ability to reference old projects. Previously these archived projects counted toward your total number of projects but now we only bill you for the projects that are active. We hope to continue lowering pricing and giving you more value for your money as we continue to grow. We hope all of you had a great month. As always, please send any feedback our way! Manage It v4 is out, get it now!